The Aphex Twin Big Bottom Exciter is one of several pieces of recording equipment that sit idly in the corner of my kitchen. As the name indicates, this twelve-by-two-by-two-inch box is designed to excite your bottom. During my DJ phase, that period of Clintonian prosperity and techno-euphoria when all I wanted to do was make "hot" music, the Big Bottom Exciter became a kind of talisman. I inherited/stole the Big Bottom Exciter from a wealthy friend from college who got caught up in my fascination with beats. I was fortunate to have him as a collaborator because it turned out that "making beats" mostly involved buying equipment. 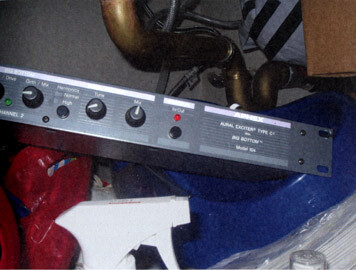 It was in the pages of Future Music that we first laid eyes on the Big Bottom Exciter. I don't know if it was the allure of getting a whole creative process in a single box or the thrill of recognition that one of our favorite artists was named after this company, but we (he) immediately bought it. We thought of the Big Bottom as a magic box, like the Echoplex in King Tubby's studio that he reportedly cured with marijuana to get his signature sound. After putting our music through it, our tapes sounded distorted and crackly, an effect we mistook for "hot." We covered the logo with duct tape so that no one would know the secret of our sound. Our sound did not immediately find an audience, nor did it gradually find one. Eventually my partner burned through his inheritance and went to grad school, the Internet bubble burst, Bush got elected, and austerity returned to New York. But even today this box holds promise for me. I feel like if I could just hook it up to other things — my job, my relationship, the news, chores — they would instantly become more exciting and perhaps have bigger bottoms. This short essay is excerpted from Taking Things Seriously: 75 Objects with Unexpected Significance, a book by Joshua Glenn and Carol Hayes in which they and other writers discuss the importance of objects in their lives. This is the second essay in a series to appear on Design Observer. 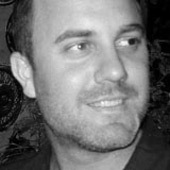 Dmitri Siegel is currently the Executive Director of Marketing for Urban Outfitters where he oversees creative, marketing and e-commerce for the brand in North America. Dmitri has published and lectured widely on the topics of design, technology and digital culture. Dmitri Siegel gets lost in the Supermarket and encounters incredibly grippy toothbushes, spouts, nozzles, Thorstein Veblen and Adolf Loos. Dmitri Siegel explores the explosive popularity of canvas totes and the history of the plastic bags they aim to replace. From Anya Hindmarch to Ireland's PlasTax, Siegel examines the role of design in sustainability. Dmitri Siegel discusses Stephen Baker's new book The Numerati and how data-mining and personalized content may impact design. Dmitri Siegel explores the various practices of design attribution. Dmitri Siegel visits Venturi, Scott Brown and Izenour's post-modern classic Guild House in Philadelphia and rereads Learning from Las Vegas.